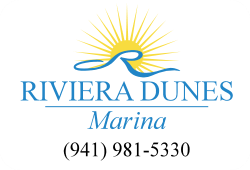 Named the Best and Most Protected Marina on Florida’s Gulf Coast, and consistently awarded Florida’s Clean Marina Certificate year after year, Riviera Dunes Marina offers secure and quality service that is second to none. Rest easy knowing your vessel is safe in our deep water cove, while enjoying all the extravagant luxuries included at the premier Bradenton area marina. Our knowledgeable marina and office staff are always happy to help. Whether it’s arranging the proper slip to fit your preferences, or helping you tie up upon your arrival, Riviera Dunes aims to please. Meet our wonderful staff, and then call to book your slip with us! 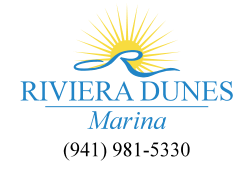 Still not convinced that Riviera Dunes Marina is the perfect home for your vessel? See what our boaters have to say for themselves. Check out our Boaters’ Blog.